When you think about it, guys have been using shaving brushes for a few hundred years. There is probably a good reason for this, right? Definitely. The invention of canned shaving cream is incredibly useful, we aren’t denying that, but you certainly don’t get the same benefits that you do from a shaving brush. A shaving brush provides the user with many more benefits than just applying shaving cream, and we are going to cover a few of those with you. The shaving brush allows the user to evenly spread the shaving soap. Your hand can do a pretty swell job, but it just doesn’t compare to the shaving brush. The shaving brush allows you to whip up the soap to the optimal thickness, and it allows you to apply a slicker coat. The bristles from the brush exfoliate your skin. They are able to reach under your skin pre-shave and tenderize your face. This also helps your skin post-shave; it helps keep your skin healthy, and it fights things like razor burn, ingrown hairs, etc. It raises your facial hair so you can get a better angle when you’re shaving. This will generally give you a closer, longer lasting shave. A shaving brush will allow you to use less shaving cream or soap. This is for a few reasons: a smaller amount goes a longer way because you’re applying it in a more effective manner, it also allows you to customize the thickness of your product. If you use a shaving soap puck, it should last you about twice as long than if you were to use shaving cream. So, in general, when you use a shaving brush, you’re more in control of the application of the shaving soap. It’s aids in providing a closer shave, it will keep it smooth for longer. You should have a nice shaving soap puck picked out. There are plenty of options out there, we usually recommend Col. Conk. Additionally, you will need some sort of shaving bowl or mug. There are different types, it’s important to keep in mind that ceramic will take longer to heat up, but it will hold it’s heat for longer if you intend to take your time with your shave. Metal shaving bowls will heat up faster, but it will also lose it’s heat quicker. It might be a good idea to keep both around in case you’re in a hurry. Synthetic bristles: Synthetics are good for entry level wet shavers and those who would like to avoid animal fur. The bristles are a medium stiffness. Although they won’t hold lather as well as one of the badgers, they’re still capable of giving you the wet shaving experience. Boar bristles: Boar bristles are the stiffest of all of the shaving brushes. They are also the least expensive. The good thing about boar bristles is they can easily reach under the beard and really open up your pores. It might not be the most comfortable brush, but it is certainly effective. Pure badger bristles: Pure badger is the lowest grade of badger available, but even the fact that it is a badger makes it a higher quality shaving brush. It’s a good mix of the badger and the boar because it’s a badger, but it comes with stiffer bristles. It’s a very good median brush, and it won’t break the bank! Super Badger: The super badger is an upgrade from the pure badger, but it isn’t quite the best. The bristles are slightly less stiff than the pure badger, but they are slightly more stiff than the silver tip badger, which we will get to in a minute. It’s the mid-grade out of the badger brushes, and it can be identified by its distinct white tips. Silver tip badger: Again, it all comes down to your style of shaving and the tenderness of your face. However, it is widely regarded that the silver tip badger is the best shaving brush available. It is also the softest bristles that are available. However, you’ll pay for the luxury; these brushes start out at $150 and go up from there. If you take wet shaving serious, you’ll want to grab one of these eventually. We just recommend keeping a backup for when your kids want to play with your brush or when you have to travel. Next, you will also want to invest in a stand. The stand doesn’t have to hold all of your shaving items, but it will definitely need to hold your brush properly. Proper storage of your shaving brush is absolutely necessary. These things are expensive, and you will greatly extend the life of your brush if you store it correctly. Lastly, you will need towels. You’re going to use a lot of them, keep plenty around. We’re going to walk you through the entire process of using a shaving brush. Although you might not have all of these tools at your expense, you should be able to pick out what helps you most. Also, sometimes you’re in a hurry, and we get that, although, you will save time in the future by not having to shave as much. The shaving brush will only work well if you use it with all of the tools that it was made to work with. Start by blotting your face with a hot towel. Giving yourself an entire hot towel treatment will work best, but we don’t always have time for that. Make sure your soap puck is placed at the bottom of your shaving mug. It should fit in there snug. If it is too big when you buy it, try running it in the microwave for a few seconds just to soften it up. Once you have it in the bottom of the mug, let it sit, dry, and settle. Start running some hot water into a bowl, then stick your brush in there. Let it sit until the brush is completely submersed in water. Once it has, take the brush out and tap it against the bowl to get rid of excess water. It’s good to get a considerable amount of lather on your brush. When you apply the lather, try going in circles. This will help use the brush to it’s fullest potential. With each circle, you’re simultaneously exfoliating your skin, raising your hair, and applying a nice coat of slick lather. After you’re done with your shave, it’s crucial to take care of your brush after. Start by using a towel to dry off the brush. You do not want to leave it soaking, however, if it is damp, that is fine. This is where your stand comes in. Hang your shaving brush on your stand with the bristles facing down. This will allow it to dry evenly and naturally without creating a curve or just plain ruining your brush. If you store it properly, you’re maximizing the investment you put into your shaving brush. You’re done! Depending on how your look at it, wet shaving can be a very rewarding process. 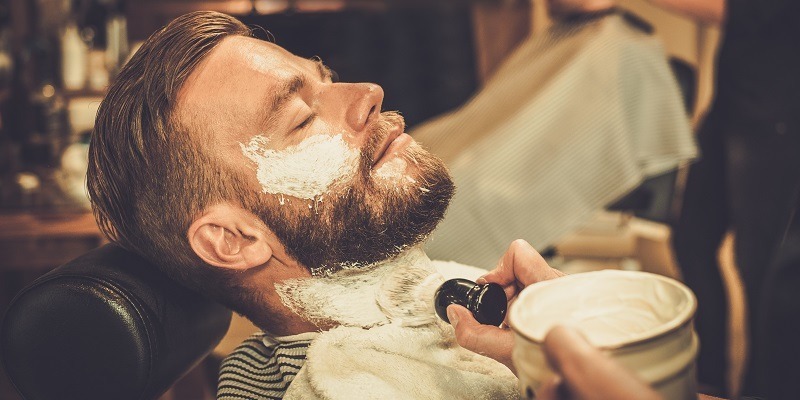 Sure, it’s not as quick as some of us would like it to be, but if that is your worry, I can almost guarantee that if you wet shave correctly, it will save you time later in the week because you wont have to do it as often. Also, once you get into the habit of it, you’ll figure out your own style. Once you do, that should make the process come along much quicker. Lastly, there is just something timeless and exceptionally manly about pulling out the shave brush and applying the lather the way it has been applied for hundreds of years. We think once you give it a try, it’s unlikely you will go back to the shaving cans!